On Friday, a young kid on the crew unexpectedly gave his notice. 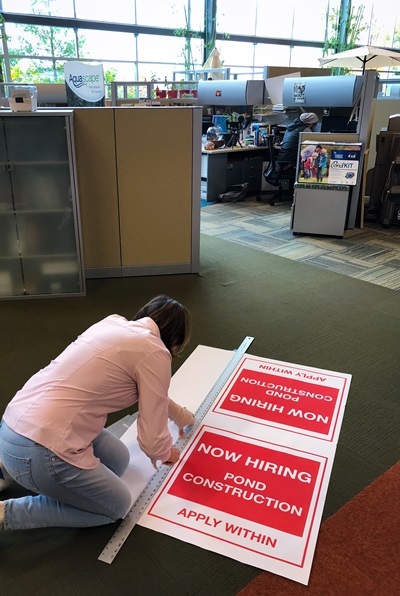 On Tuesday, I saw our Marketing TEAM already making signs to promote that we are hiring for his position. I didn’t tell them to do it. I don’t have to tell people to do most of the things they do around here. If I’m doing my job to guide and guard the company culture then the TEAM will do their job, which is to keep the company humming regardless of what happens. I’m never not thinking about our culture, which means I’m always thinking about the people who make up our TEAM. You’re only as good as the people you have on your TEAM. Even Michael Jordan had four other teammates on the floor with him at all times. And if you want to be part of the Aquascape TEAM … WE’RE HIRING!